As promised, NBA Live 14 pumped out a very large patch today to address the many shortcomings, omissions or problems the title showed at launch. Straight away it includes something that should make the game a lot more understandable: A simple practice mode. "Shootaround" is the first thing you'll see when you download the patch, which went live today. Though it's just an empty gym where you can practice dribbling and shooting without a clock or opposition, the inclusion of any new mode, in a patch, speaks of an effort to put things right. And "Shootaround" is useful, mostly because it allows you to practice using a single player with the camera angle for the game's Rising Star career mode. You scroll through a menu of ballhandling and shooting commands, with the stick and button directions displayed underneath. There's no feedback to tell you if you successfully completed the move, but you can live without that. You probably know what an in-and-out and a crossover look like. Shootaround also shows you just how long some of these animations can take and the trajectory you need to take to the basket, (or how early you need to start them) particularly with the eurostep. This really wasn't visible in the only other "practice" option, which was to create a game with all the rules turned off and the shot clock deactivated. There were still nine other guys on the court, too. Shootaround does a solid job of connecting you to the controls and, yes, with this laboratory environment, especially the up close camera, you get a better sense of the control theory. 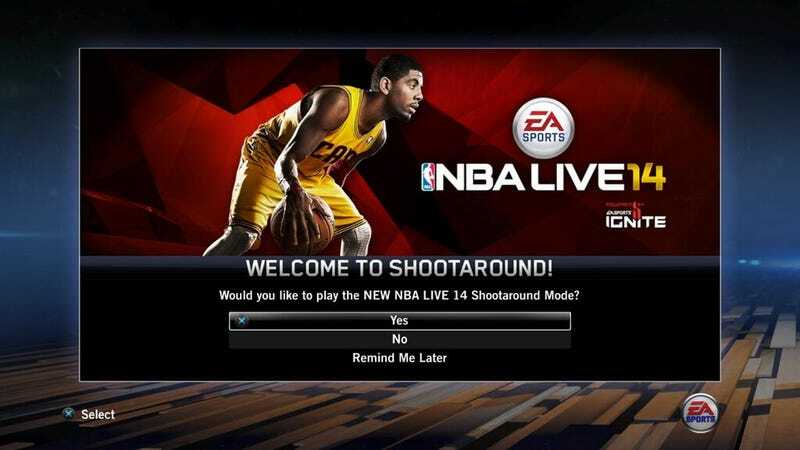 The patch notes promise that shootaround will "serve as the foundation for NBA Live 15." I'm not sure what that means exactly, other than EA Sports is committing to another edition. The rest of the adjustments address more pointilistic concerns, ones that players with a lot of time on the game will notice more than those who haven't played it much. The lighting and coloring have been toned to reduce the plasticky look of players' skins. Animations and transitions between animations have been tuned and smoothed out but, as I've said, you can interrupt them at any point and launch into a shot if you're impatient on the buttons. That's where practice mode can help out too. Features like improved passing speeds and better lead passing are something I'll just have to take the developers' word for right now. The patch also rolls out the jerseys for the upcoming NBA All-Star game, plus some throwback uniforms and, if you want to zoom in, a regulation ball featuring the signature of NBA commissioner Adam Silver, who took office at the beginning of the month. When NBA Live 14 pushed out its first patch there wasn't much to cheer. It was largely a foundational work, setting the tone for what EA Sports wanted to deliver today. The game that was published in November still wasn't ready to be released, and nothing changes that. But the post-release support is laudable, and this patch shows a team owning up to its shortcomings and working to overcome them. For more details on what the patch addresses, see the link.